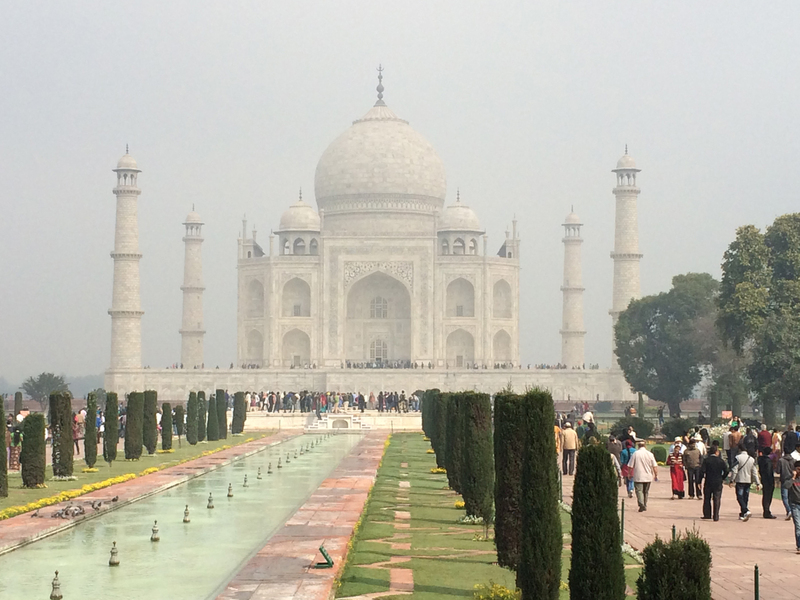 Day 17 – Last day on Indian soil. I can take or leave the Taj Mahal. It’s so cliche. One of the first questions I’m asked when I return from India, “Did you go to the Taj Mahal?” This is India to most people. I get it. And a little piece of me resents it. India is so much more than one man’s monument to a woman. But, now I am here. Now I see it. Now, I am mesmerized. It’s beautiful and incredible and magical. But let me back up a little. We get up early, shower, pack and make our way down for breakfast. The dining room is not open yet. It was supposed to be open 10 minutes ago. This is India. After gulping down tea and shoveling a few forks full of food into ourselves we meet our guide in the lobby. As he’s explaining the beginnings of the history of the Taj I notice we seem to be located in the middle of a cloud. The fog is so thick that the glass doors look like they will be harder to open. I love fog. Now, I’m excited. We take a walk down the street. Our hotel is located along the same boulevard as the entrance to the Taj Mahal. As we get a little closer, small shops, a fruit cart and parked horse-drawn carraiges begin to dreamily emerge. Ahead a tall, terra cotta structure begins to come into view, the top still shrouded in fog. It is the entrance. We are corralled again to await our group instructions and led single file to the purse inspector. We were told at the hotel that we could not have on our person, in our purse or in our mouths any gum, candy or other food item. As we hand over our purses a stern woman with rubber gloves paws through them, glancing up at us occasionally. Beside her there is an orange bin full of things on the naughty list. Once we’re cleared we hover close by to await further instructions. Someone is pointing up at the roof. 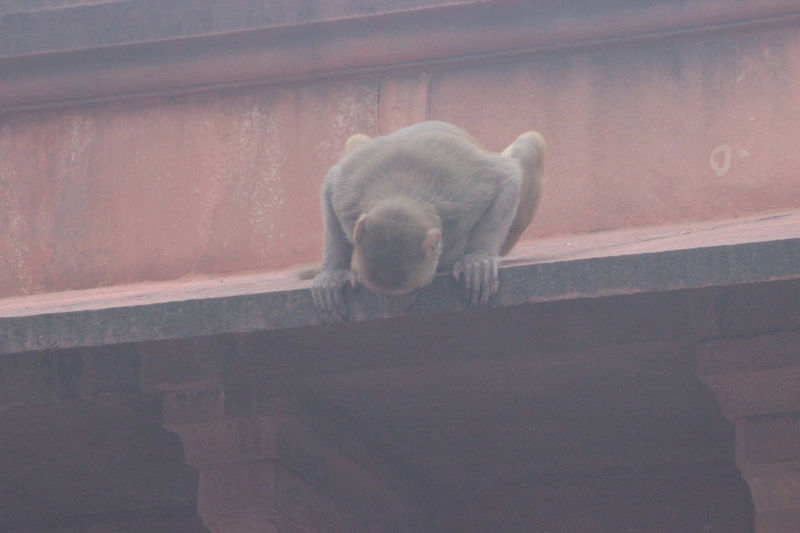 There is a monkey perched on the edge looking down at the people coming in. More likely, he is checking out the growing stash of treats. His next move will prove my postulation as he jumps down, sits beside the bin and picks his treasures. He stores some between his teeth for safe keeping and grabs the rest with his hands. The stern woman glances at him then continues to search purses. 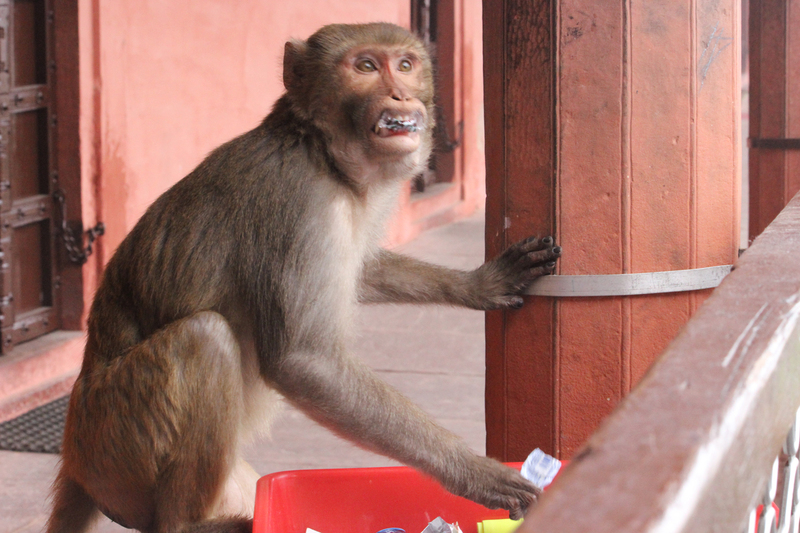 So monkeys can chew gum and have candy, but humans cannot. We are guided along a wide path. It’s still foggy and we’re assured the Taj Mahal is, in fact, here somewhere. Placed before a tall, wide arch we’re told it’s there, in the distance, behind the fog. We trust. At the top of the steps the grounds open up. There is the long reflecting pool that leads to the Taj Mahal disappearing into the fog. It’s beautiful and mysterious, choosing to reveal itself slowly, as if we couldn’t possibly manage all of it at once. Walking along the water, lined with meticulously manicured lawns and gardens, the base of the huge white marble structure begins to appear. It is not until we are right in front of it that we can see it. Although we can now touch the marble of her skin, she is still only willing to reveal a piece at a time. To know her at once would be a mistake. We must learn to appreciate what she’s made of, why she was built, how. We wander through the inside, our guide shares her Persian history, the details of perfection of form, little nuances that could be missed, would be missed, if they weren’t shared. For instance, the four outside pillars topped with minarets are deliberately built at a slight outside slant so that when the whole of it is taken in they look straight. If they had been built straight, perspective would have caused them to look as if they were leaning in. While the Taj Mahal is a monument of love from the 1600’s, it has its sinister history as well. Times were more barbaric then. There is so much history I couldn’t possibly do it justice. Suffice it to say, my take it or leave it attitude changed as I was educated on its story and captivated by its beauty. However, like any professional wanderer, I am distracted by two bright green parrots sipping water out of a puddle. They fly away. I follow them. They take me through the gardens and other areas of the grounds I missed. With their help, I am walking back toward the entrance now. The fog has lifted quite a bit and when I turn around I can see the whole majestic structure. A thin veil of fog allows for a moment more of modesty, but the sun’s rays are too powerful to allow her to hide for long. I run into Karin who is coming back from the bathroom and we decide to wander together. Near the front entrance there are many, many people now. There seems to be one spot where people stand, hold their hand up and pinch their fingers together so the final photo looks as if they’re holding up the Taj. This is photo-op central. An hour ago there was no one here, now we can barely find the center-most point for the best picture. Our group meanders toward us and we decide to go. The guide who has taken us on this odyssey of the Mughal Empire will continue to lead us back toward our hotel. He tells us there are many shops and the owners will try to pull us in with the promise of marble, but most of the marble they have is fake. Instead he takes us to a government approved shop where they show us the tools that were used to construct the Taj Mahal. Then we’re guided inside where many sales people await our rupees. It’s a set up. Not the first. A few of us purchase small chachkes and as we turn to leave through the door we came in, we’re told with a sweep of a hand in the other direction, “No, this is the way out.” Hmmm. We’re guided through another store, this one textiles with desperate sales people unwrapping scarves and laying them out so we can see how beautiful they are. We walk quickly through with our exasperated “no thank yous.” Again, not the first time. They work together in India. A rickshaw driver will take you to his family or friend’s store. A guide will do the same. If you don’t have the address and an exact time when you get into a car, taxi or rickshaw, the driver will take you to “a nice shop” along the way. Out on the street, the onslaught of pleas to see and buy continues. Now without the protection of our guide we walk with purpose back to our hotel. It gets tiring, this constant refusal of services and merchandise. It’s our last day and I just want to wrap it up and get on the plane. But, that would be too simple.